The Cutt-n-Yelp is a pretty average box call. It makes nice sounds, but nothing out of the ordinary. It has pretty good tone quality and does have very good volume capabilities. It is constructed well and seems a sturdy call. Not a bad call for the price. One thing I have to mention about this call is the "Revolutionary Cutter Adapter", which is screwed into the bottom of the sound chamber and gets big advertisement/billing on the Turkey Duster web site and on the packaging of this call. The "Cutter Adapter" is supposed to make cutting easier and sound better on this call than your average box call. Frankly, I found it twice as difficult to make good cutting sounds using the "Cutter Adapter" than I could make like you normally would on a box call. I feel like the "Cutter Adapter" is just a sales tool/gimmick. It definitely doesn't add any practical usability to the call as a whole, in my opinion. 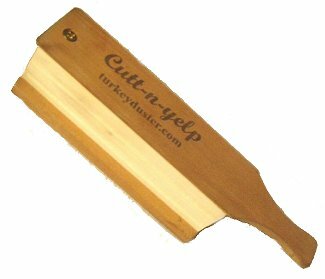 I will likely use the Cutt-n-Yelp on some turkey hunts in the future, but it's not going to be a call I can't leave home without.